A Register is a list of anything you like, typically replacing all the spreadsheets your company are using. There is no limit to the number of Registers and you define the fields (columns) of each that may be dates, lookups, text, checkboxes or currency etc, each with its own access security. Registers may be sorted, filtered, grouped (like a pivot table) and your personal filters can be saved for fast access. 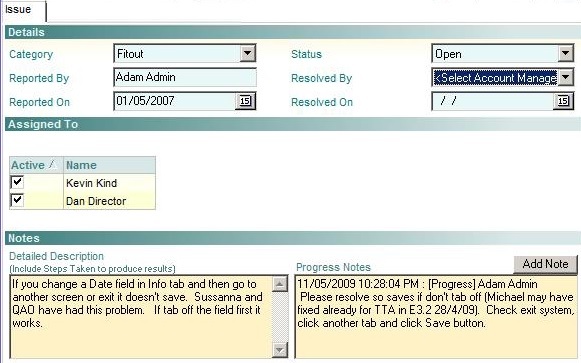 Below is an example of an Issue Register and an Issue. A typical use might be to right click in the Register and filter say on a Client or Status, double click on the first issue to show the details, and then use the Next and Previous buttons to navigate through the issues.